Patch with initial fork of user notes plugin for bbPress. Notes are stored in usermeta, this ties them easily to a user without needing the flexibility of a custom post type. If it gets to the point where there's so many notes on a user that that it becomes unmanageable as a usermeta I would instead lean towards handling the user and it's a problem on the moderation side more so than the need for more flexibility. 2272.patch​ (11.4 KB) - added by Clorith 2 years ago. no-notes.PNG​ (24.7 KB) - added by SergeyBiryukov 22 months ago. notes-in-post.PNG​ (30.3 KB) - added by SergeyBiryukov 22 months ago. notes-in-profile.PNG​ (14.3 KB) - added by SergeyBiryukov 22 months ago. notes-wporg-forums.PNG​ (34.0 KB) - added by SergeyBiryukov 22 months ago. Added "Edit" and "Delete" functionality. Notes can be added directly on profile pages as well. Notes are auto-expanded when adding, editing, or deleting a note. Looks OK in the old theme as well, which is still in use on some Rosetta sites: notes-wporg-forums.PNG​. Support Theme: Add styling for user notes toggle. Support Forums: Allow moderators to add notes to users. Props Clorith for initial patch. 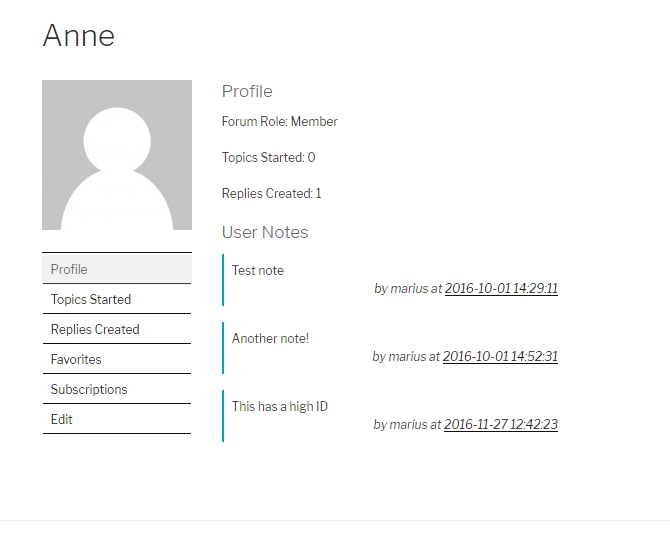 Support Forums: Display user notes before post content, closer to "Toggle user notes" link. Remove unused $post_id variable from ::delete_user_note(). Support Forums: Store site ID in addition to post ID associated with a note, as post IDs are not unique across Rosetta forums. Support Forums: When editing a link, only save new text, don't overwrite existing meta data. Don't show "Edit" or "Delete" links for notes made on another forum. Support Forums, User Notes: Link moderator's username to the correct site. Support Forums, User Notes: Rename "Toggle user notes" link to "User Notes", to prevent "Unflag Author" link from wrapping to a second line. Only keymasters or the note author can edit a note. Only keymasters can delete a note. Support Forums, User Notes: Make sure only keymasters can see notes on moderators. Support Forums, User Notes: Add view=all to post link associated with a note. Support Forums, User Notes: Cache notes output to a static variable, following the idea from the original patch, to avoid repeated template function calls. Support Forums, User Notes: Make plain text URLs in notes clickable. Support Forums, User Notes: Apply comment_text filters to user note text, including wpautop() and make_clickable(). Remove redundant wp_kses() call, as it already runs on saving. 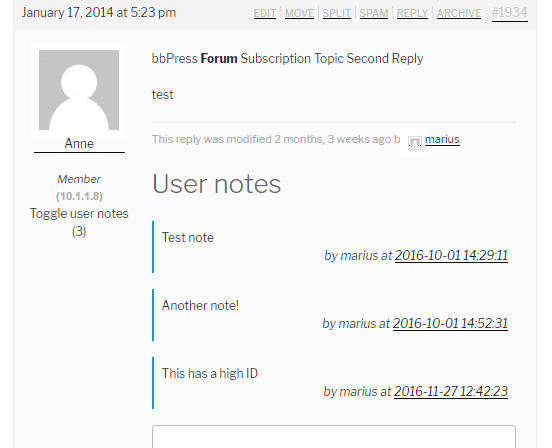 Support Forums, User Notes: Make sure notes are only displayed for other users. Support Forums, User Notes: Allow super admins to see notes on the current user. Support Forums, User Notes: After , make sure the dynamic elements of note adding/editing form (post ID and permalink) are still dynamic. Support Forums, User Notes: Introduce .has-user-notes class to allow for custom styling.